I’ve talked a lot about my essential oils, but wow, they are really incredible! 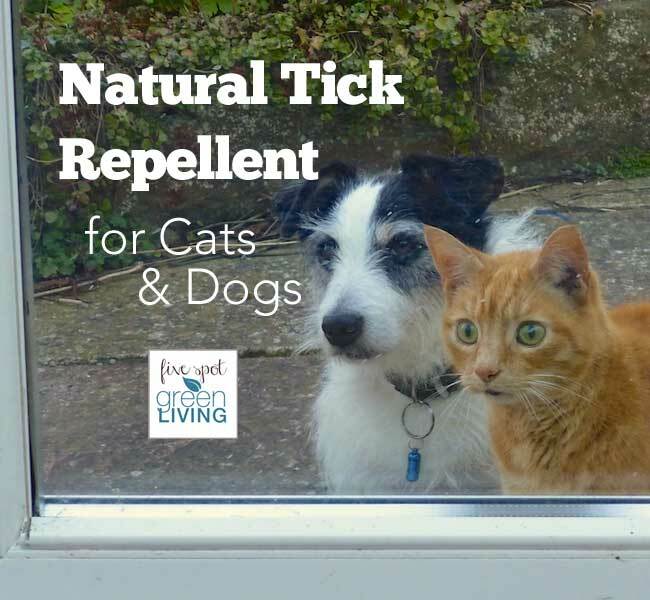 I’ve found they are my go-to when cleaning the house, especially when I am trying to figure out how to remove cat urine smell from my carpets and clothing. This summer has been a difficult one for us pet-wise. We have struggled with trying to remove cat urine smell all around the house, something we’ve never really had to deal with before. My 6 year old kept finding puddles in her room, or she would go to put some clothes on and they would reek of cat pee. YUCK! Poor kid. We finally started closing the door to her bedroom, but the cats just moved on to the master bedroom. We treated the old cat when we realized he was a definite culprit and made him more comfortable, though the vet warned he may be cured of his UTI he is still old. Sigh. Then, the big, fat, hairy siamese cat started peeing behind the toilet in the bathroom. Yes, at least he was nice enough to restrict it to the bathroom, but he was mean. He was in so much pain he was lashing out at the other cats and us. He sometimes goes through periods like that when the seasons change, but this didn’t end. We just couldn’t live with him like that and realized it was not normal. So in her went to the vet. You should have seen me trying to get an angry, aggressive 16 pound siamese into a cat carrier! We opted to get injections for him rather than the pills, needless to say. In the mean time, we had to put my old kitty down, which broke my heart. I loved him so much and it’s hard when I realize he’s really gone. To make a long story short, we took the third and youngest cat in to be tested when we found him peeing in the dining room. He actually had the worst case of UTI but barely let on that he was sick! Poor kitty. 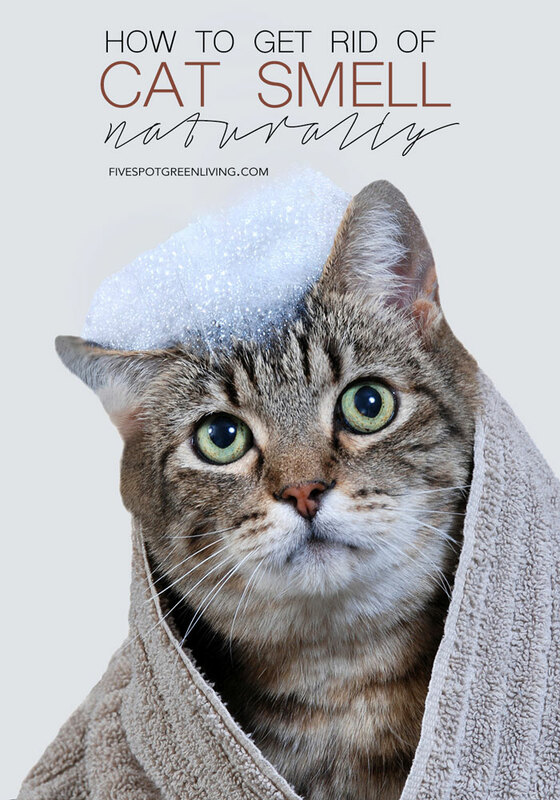 One of the best things for cat health is water. LOTS of water. After switching to a fountain water dish for my cats, we have not had any UTIs in the house. And no peeing! 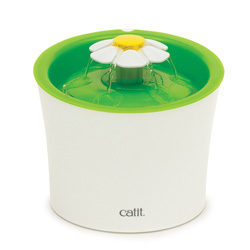 We’ve tried a few and I have decided I love this Catit Flower Water Fountain because it offers a constant stream of fresh filtered water and the cat can drink in a comfortable standing position! It includes a triple action filter to help prevent urinary tract diseases by removing magnesium and calcium from tap water. 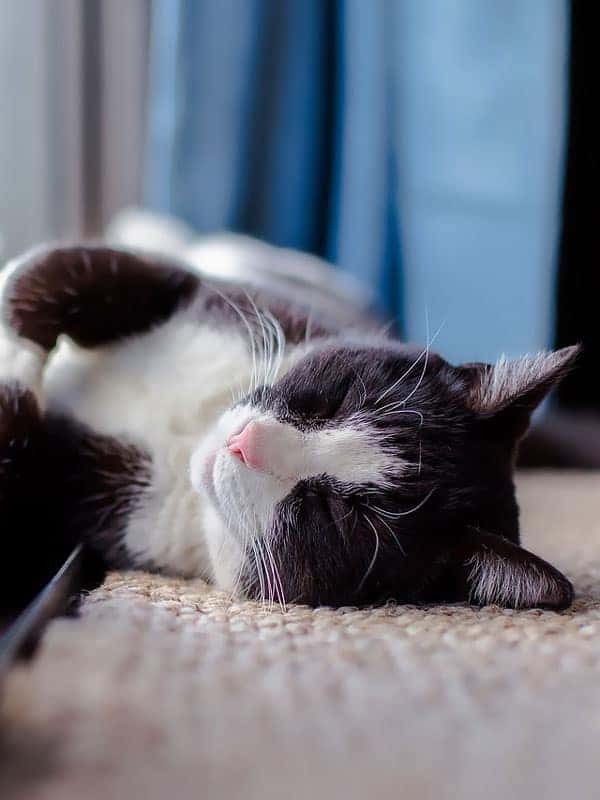 These minerals can accumulate in your pet’s lower urinary tract and lead to urinary tract diseases, which is a common health issue for cats. Additionally, this high performance filter removes chlorine odors and bacteria, and retains stray hairs, sediment and debris. We have changed the cat’s food and are paying more attention to their litter box. It was really hard with three cats to keep it clean, especially when we have three little kids at home. So my dear husband, NO more than two cats…EVER! Now where there is cat urine there is smell. Gross. It’s as if the walls of our house are permeable, the urine smell just getting everywhere. I am not a fan of sprays or shampoo that just mask the smell – I want something that is actually going to take care of it. So I always turn to my essential oils to remove cat urine smell. When I find areas of carpet that smell of cat urine but are old and dry, I mix some baking soda with a few drops of lavender and sprinkle liberally. Then I let it sit for a few hours or overnight before vacuuming. The lavender and baking soda actually absorb the odor rather than just masking it. If you work the baking soda into the carpet when you apply it, the mixture will work even better. I LOVE using a diffuser to freshen the air! It also acts as a humidifier so even better! I add a few drops of whatever oil or blend I decide and then it diffuses for hours. 3 drops of orange essential oil (You Can Buy Here)When all of the ingredients have been added, gently shake the bottle. Now simply generously spray the affected area with this solution and allow to completely dry. It will become powder-like once the formula dries. Once it dries vacuum up the powder. If the smell is still there, then sprinkle a few drops of 100% pure Orange Essential Oil on the spot and gently rub into the leather with your fingers. Wipe dry and let sit. Enjoy your urine-free couch! 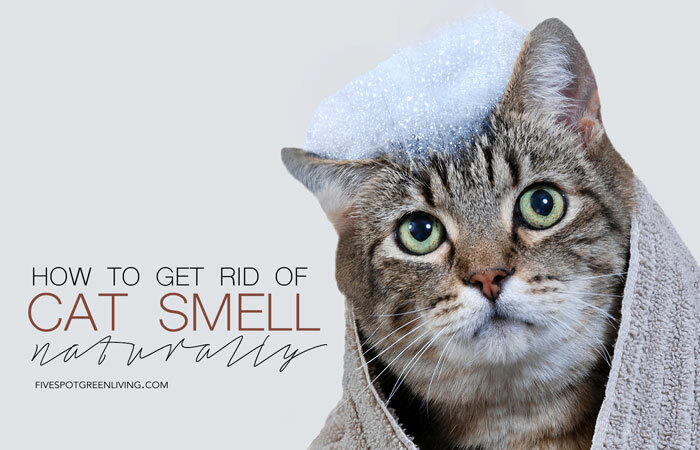 Do you know how to remove cat urine smell naturally with different methods? Let me know! Thanks for the tips! I have a cat that has a spot by our basement door where she likes to pee instead of using her litter box. How much lavender oil, how many drops, do you use in how much baking soda for the carpet? I’m super excited to try it but I naturally think if I add an oil to the soda, it will just be 1 clump. I put about 3 or 4 drops in the baking soda and then mix well with a fork. It will mix up and not be clumpy, I promise! Molly I would love to know that too.My cat sprayed my leather chair. It is driving me crazy. Thank you for the tip. I’m going to assume this will also work on cement? I have learned the hard way that if the litter box is not clean enough Lizzy will go right next to it. Though before her brother Edgar got sick one or both of them just went wherever they wanted on the garage floor. We tried to clean it last summer with vinegar And bleach but it didn’t work. I even tried tsp and bleach, but no go. And because I had the door slightly open for them to get out to the garage, my house reeked. The guy putting in my new dishwasher held his breath and probably did the fastest install in his life. How embarrassing! I finally got a cat door put in so that stops the smell. And I try really hard to keep the boxes clean. So now the garage smells of scented litter with an undertone of pee. I just bought some oils and will try this over the weekend. At least in a small spot until it stops raining and I can empty the garage and do the entire floor. Then maybe I’ll get some epoxy on it so none of us will have to go though this again. I had the same issue. I used Hydrogen Peroxide to clean the mess then painted over it with Kilz to lock it in so kitty couldn’t smell it any more. I hope this helps. how much baking soda, should we add too the Lavender. About half of a cup! Oh no Lucia! I’ve been having trouble with my older cat peeing on my curtains. I would spray some vinegar on the backrest. You can put the lavender right in the vinegar. Don’t soak the seat but just enough to saturate. I’ve done this before in lieu of the baking soda solution and it works great. I have a cat that peed on the floor and walls and now that I am remodeling my home the smell is awful!!! HELP!!! What can I spray on concrete floor and walls that need fresh paint! For concrete floors I was very successful with farm grade hydrogen peroxide and baking soda. Put the hydrogen peroxide on floor (35%). After a while put baking soda on it. Will soak up the smell. Clean it up and smell is gone. Be warned that 35% and higher is often a restricted product and you have to show ID in order to buy large amounts. It can also cause materials to be flammable. I have used it with success. No fires. Just stuck around till it cooled. I used it on a couch too. It worked ok. But had to open the couch up sort of speak so the cushions and back didn’t get too hot. Google it and you will find more info about it. I had some linens given to me, the smell was awful, but washed them with 1/2 gallon of vinegar in the washer, dried them, they still smelled but figured they were still warm, and put them in my cedar chest, now EVERY THING in the cedar chest smells, I open the lid and the smell fills the house and lasts for days. I am going to make sachets of your mixture and put several in it, BTW we are from roughly the same area of NH (in TN now), I miss swimming in Lake Sunapee! Here too many poisonous snakes so its the pool only!!! I rent a place and must be the people before us had cats. The floor got wet from the roof leaking from rain and now it smells like cat pee. Will the baking soda and oils work on old stains? She my comment above about farm grade hydrogen peroxide. I have used it but Google re precautions when using. I also use this and baking soda on clothes that need to be cleaned of cat pee smell. Works well. Thank you for sharing your wonderful post at #OverTheMoon. I look forward to what you will share next week! Like someone in person today! We hope you’ll come back again next Sunday when we open our doors at 6:00 PM EST. Pinned and tweeted! We have 5 Siamese cats and they are territorial . I have one that refuses to use a litter box at all. We keep all carpeted rooms closed off from the kitties. Apple cider vinegar is great. I pour it straight on the floors and it is the best odor removal we have used and much cheaper than the commercial enzyme products. After using the expensive stuff on a bedroom floor that the former owners kept a puppy in, I resorted to pouring gallons of apple cider vinegar on the entire concrete floor. ( we had to pull up the carpet. I have had no problems with any discoloration on floors or clothes. Hi – thanks so much for posting this. I’ve saved this article to my flashdrive to try some of your tips at home!!!!! My cat seems to think peeing on my recliner is the thing to do…. yeah right. I’m about to put it by the curb but cant bring myself to letting someone else have that smelly thing in their home. So I’ll try this before ditching it finally out of frustration. Found ya on Create with Joy! Thanks! Great tips! Pinned! Hopefully I will never need this post! Lol My cat is getting up there. Sounds like a whole lot of not fun. Thank you for sharing on Merry Monday! Hope to see ya next week! Such great tips for cat owners. Thanks for sharing on More the Merrier Monday link party! !